Russian club is the clear favorite, as no. 1 seed and defending champion. Actually, Orenburg plays for third MECL title in a row playing its fifth consecutive final in ETTU competitions (2010 ETTU Cup winner, 2011 MECL finalist, 2012 and 2013 MECL winner). Should Dimitrij OVTCHAROV, Vladimir SAMSONOV and Alexey SMIRNOV manage to reach a new trophy, this would equalize Borussia`s achievement from 2009 to 2011, whilst Belgian Charleroi remains record-holder ad they did it four times in a row (2001-2004). Fakel Gazproma suffered just two defeats in last two editions. They had 9-1 score in previous season and 7-1 in this one (defeat in semi-final game against UMMC). Orenburg is, above all, five times Russian champion (2005, 2006, 2008, 2011, 2012). Vladimir SAMSONOV has unique chance to lift MECL trophy 11th time out of overall 16 editions of this prestigious competition. Vladi aims to level all-time record in all sports. Former USSR basketball women player Uljana SEMJONOVA (213 cm) was European club`s champion 11 times, all with Daugawa (8 consecutive 1968-1975, 1977, 1981 and 1982). 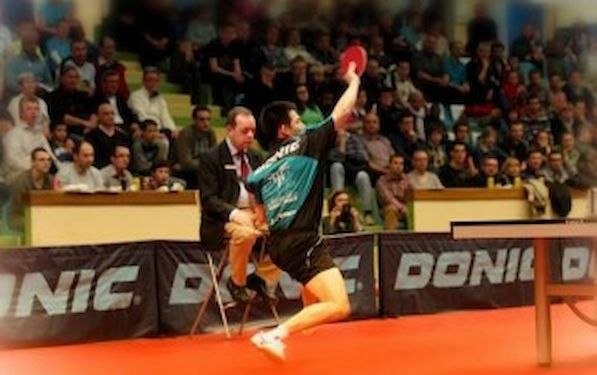 Table Tennis` legend from Bielorussia won his titles with three different clubs: Borussia 1997, 1998 and 2000, Charleroi 2001-2004, 2007, Orenburg 2012, 2013). He is unique player who played all 16 MECL editions. World`s ITTF ranking list favors Orenburg whose line-up consists ofthree Top-51 players: Dimitrij OVTCHAROV no. 4, Vladimir SAMSONOV no. 11, Alexey SMIRNOV no. 51. Portuguese Marcos FREITAS (no. 13), the 2013 Europe Cup winner, leads Pontoise`s squad, Kristian KARLSSON is no. 97, WANG Jian Jun is non ranked player but, it`s clear that he is able to beat anybody in MECL. Chinese has a lot of experience in this competition, as he played in Charleroi`s jersey the 2010 final against Borussia. He started his successful career as Asian Youth champion 17 years ago, when he beat TAN Ruiwu in the final (RYU Seung Min and JOO Saehyuk were semi-finalists). FREITAS and WANG are expecting the final in good shape. Portuguese improved his play since last MECL semi-final, when he managed to defeat SAMSONOV in the rematch (WANG overcame OVTCHAROV), but with no consequences for Russian side. Orenburg won 1st leg in France 3:0 and 3:2 at home. Pontoise is three-time runner-up of French Pro A League (2009, 2010, 2013) and once MECL semi-finalist (2013), but in next three weeks have to play for two titles. So, it`s not hard to imagine how upcoming days look amazing in their history. Beside two MECL final games (May 17th and 30th) they will meet Chartres in the last round of Pro A League, on June 3rd, and the winner will be the national champion. Now Chartres has 47 points (15 wins, 1 draw, 0 defeats) and Pontoise 45 (13, 3, 0). In Round 16th, two days ago, Pontoise beat away Kalinikos KREANGA`s Hennebont 4:2, as WANG Jian Jun and Marcos FREITAS both earned two points, while Kristian KARLSSON was beaten twice. Upcoming finals will confront also the oldest and the second youngest MECL participant. Pontoise was founded in 1927, and Orenburg in 2001 (UMMC in 2007).